I have owned a few Schecters from their Diamond Series a couple of years ago. Back then, everybody I knew played LTDs and I kinda wanted something different. As they weren’t readily available in Germany, I even had to go through the troubles of importing them from the US. Apart from the chunky necks (and the Duncan Designed Pickups), I really liked them. The last one, a Tempest Custom and clearly my favorite of the bunch, I sold – only to fund a 1983 Gibson Les Paul Custom – which is understandable, don’t you think? 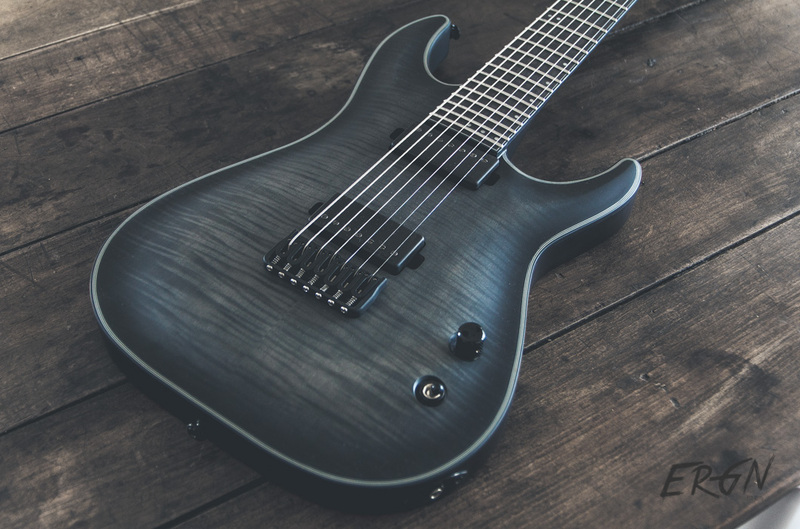 …until last year, when they introduced a bunch of really interesting guitars, including the Keith Merrow-sig – the KM-7 – leading the way. 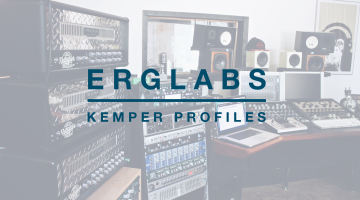 I guess Keith doesn’t need an introduction, but if you haven’t heard of the guy: he’s a very successful Youtuber, works for Seymour Duncan and plays in „Conquering Dystopia“ with Jeff Loomis… ’nuff said, this guy is legit! I was really hoping to get the white model… and received the black one. Typical, right? But seriously, it looks far better in real-life than it does in the pictures. And to be honest, the finish has really grown on me since I’ve had it.. Actually, the trans-black is more of a charcoal type of color with a slight burst around the edges. On the back, it’s see-through and you can see the 2-piece swamp-ash construction of the body. Very classy! The limited color-options (black & white) might turn some people off, though. Fans of flashy colors should wait until the new “lambo-orange” version comes out. 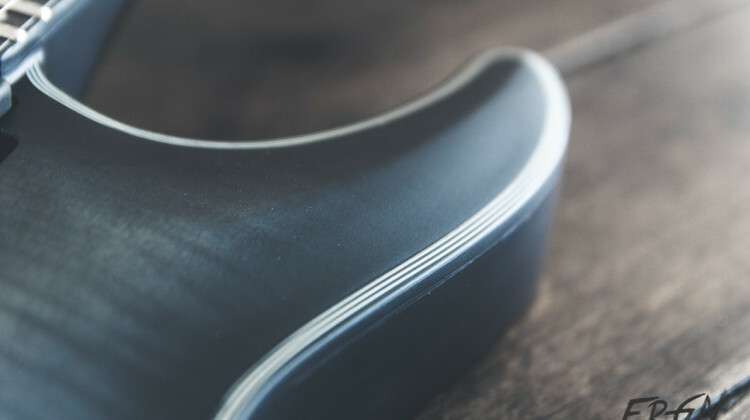 The finish feels sturdier and more durable than the regular matte-satin-finish on ESPs or Ibanez guitars. I obviously can’t speak from experience, but I assume that the KM-7 will keep its matte look for quite a while. 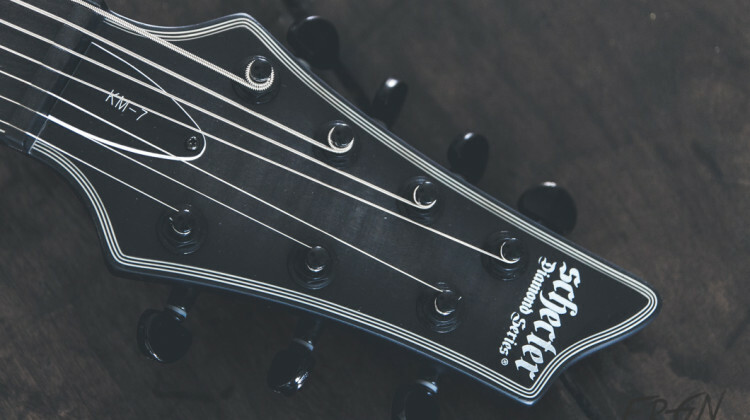 According to the Schecter website and my own experience with Schecters, I expected the neck to have a chunky-ish, round C-profile. I have very good news for you: It doesn’t! It actually has a D-profile, similar to the Ibanez Wizard neck. The back is extremely flat with pronounced shoulders – the detail, that sets it apart from the Wizard profile. 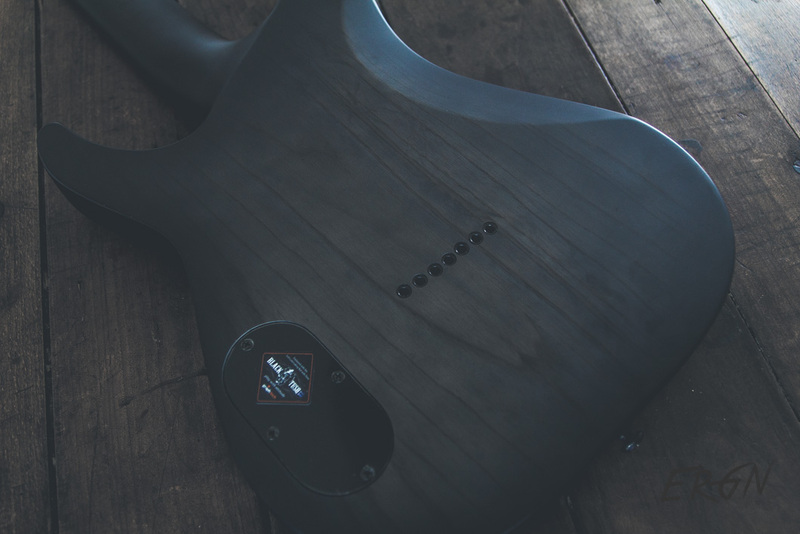 The increased angle in which the neck is rounded off is especially noticable in the higher registers, giving the player a very big and even surface on the back of the neck. It feels a bit odd at first, but after five minutes tops I felt „right at home“. 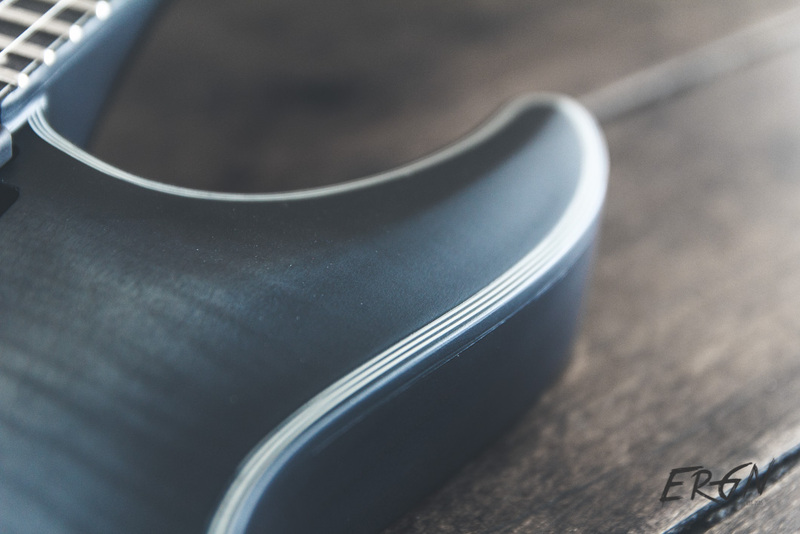 Summarized: The neck of the KM-7 is extremely comfortable and thought-out. I can totally see that the neck profile matches Keith Merrow’s playing-style. 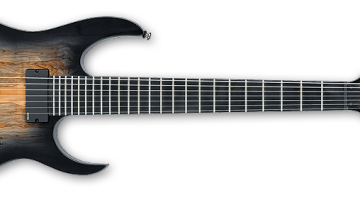 Like the recently reviewed LTD AW-7, the Schecter KM-7 comes with an ebony-fretboard. 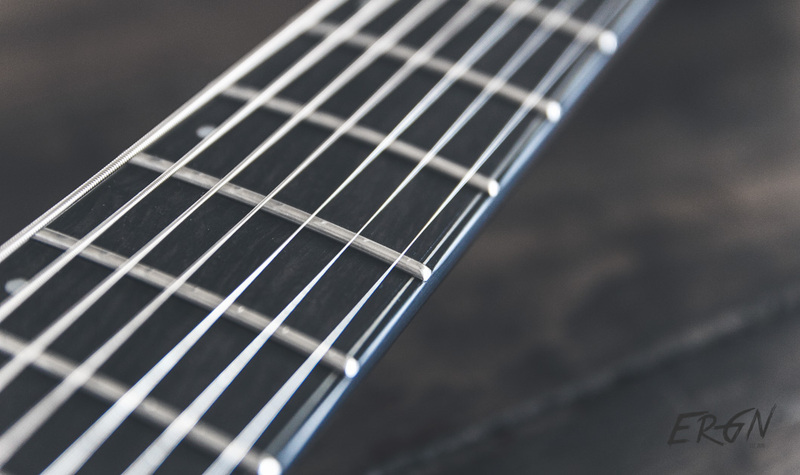 And what applied to the Alex Wade model also applies to Keith Merrow’s – the fretboard is dyed black. And I can only say it again: this isn’t a bad thing. 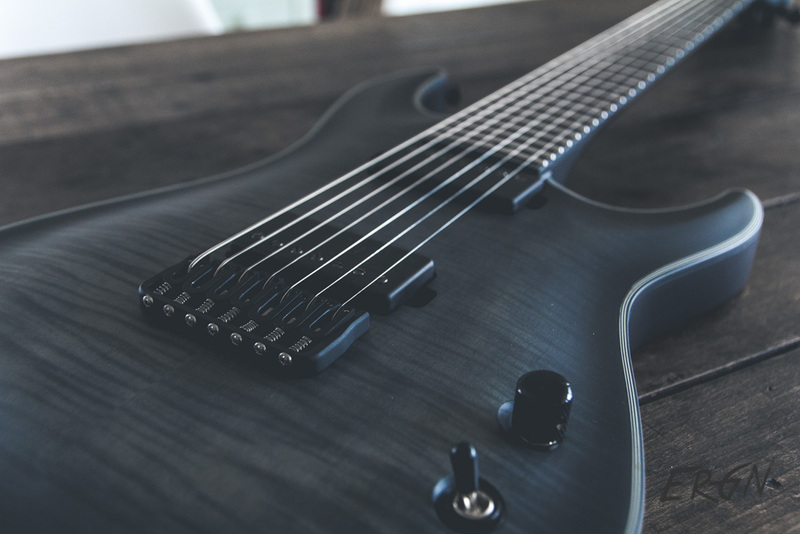 We’re practically all out of that rich black ebony, so get used to dyed fretboards already. 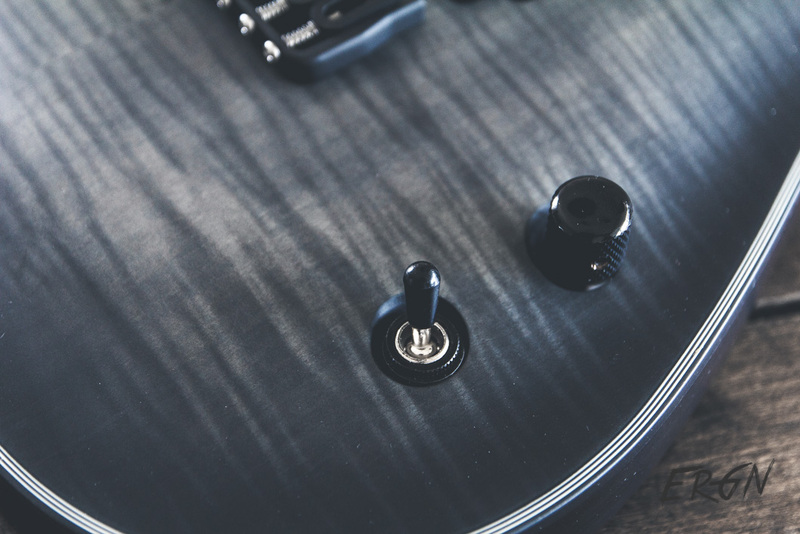 Still, Schecter does a better job at dyeing their probably streaky and cloudy, but otherwise perfectly fine ebony. 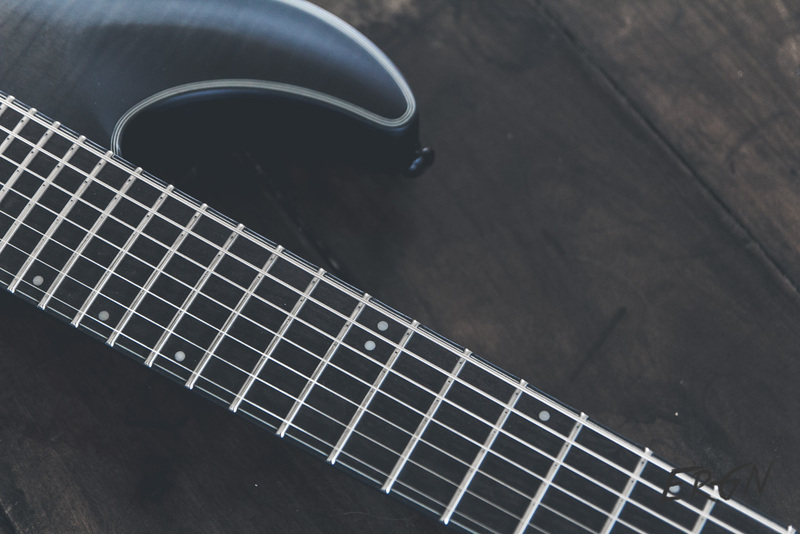 While the fretboard on the LTD looked glossy and – yeah – actually laquered, the fretboard on the KM-7 looks realistically matte. The KM-7 comes with offset dots that are „reversed“ after the 12th fret. It’s something different, but they’re still dots. It gets fancy on the side of the neck, though. 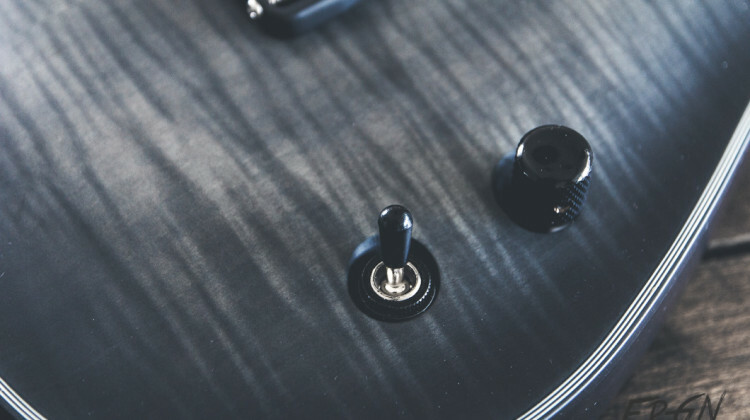 Keith and Schecter decided to equip the binding with glow-in-the-dark dots. Now that’s something you don’t see on production guitars regularly. They are bigger too, which might sound like a tiny detail, but trust me – it’s like a revelation in poorly lit conditions. 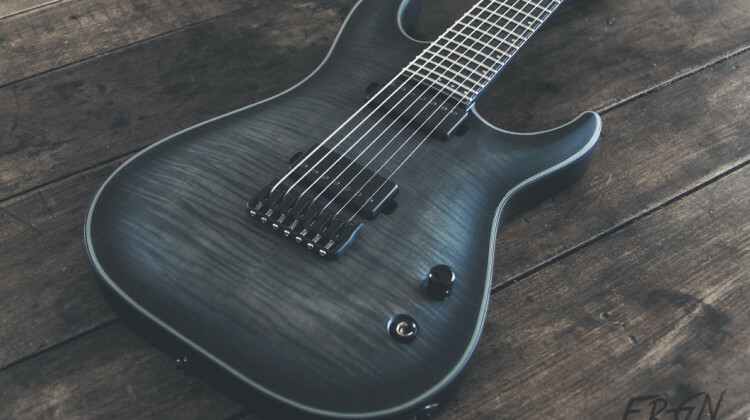 Keith Merrows signature-guitar comes with a set of Seymour Duncans (Nazgul and Sentient) and the dark, brushed-aluminium covers look extremely good in combination with the trans-black-finish. Apart from that, you get an original Hipshot-bridge and Schecter Locking-Tuners. The tuners are okay. 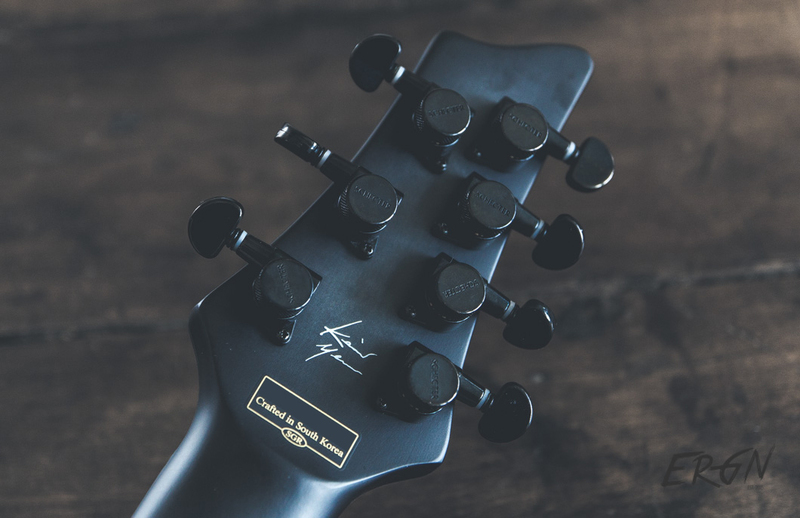 They stay in tune, but they’re also a bit inaccurate – but maybe that’s just the case on my test-guitar. You also get a 3-way-switch and a coil-splitting push/pull-poti. I never used coil-splitting, I never will … those who need it know what to do with it. Enough yada-yada. 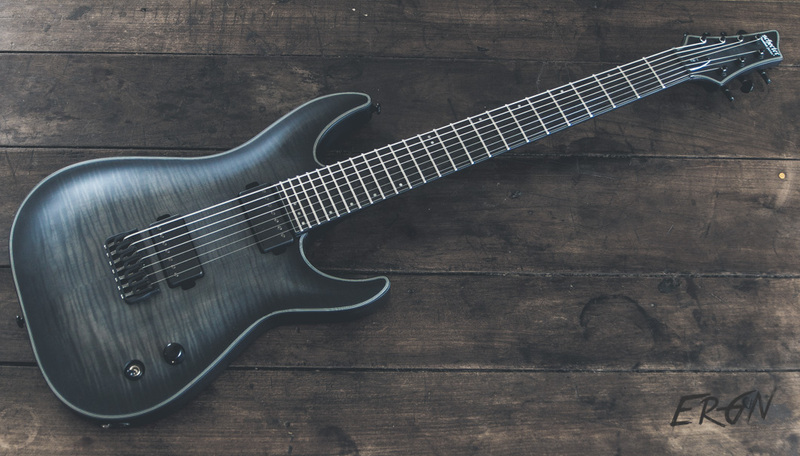 Watch the playthrough-video below to see the Schecter KM-7 in action. 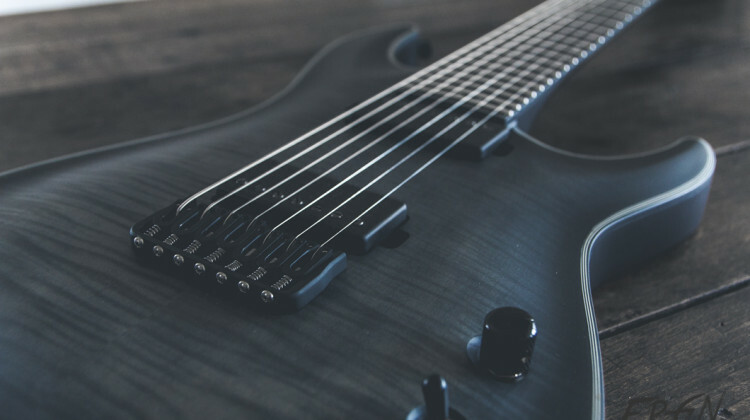 Simon added the Seymour Duncan Nazgul to his 7-String Pickup Shootout a while back and I wasn’t that impressed. It sounded good, but a bit scooped. In the KM-7, it definitely sounds better, though. 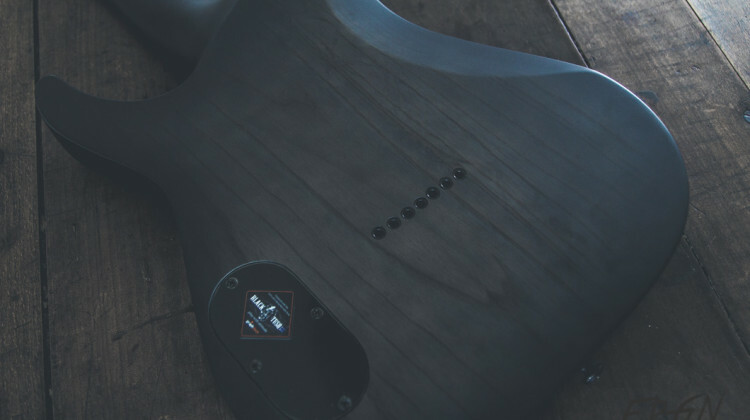 It seems like the Nazgul has been tailored to the swamp-ash/maple construction with Keith Merrow himself being involved in the making of the pickup. The guitar sounds dry (in a good way), articulate and well-balanced. I’d still love to hear the KM-7 with a DiMarzio D-Activator or an Instrumental SFTY3-7. Schecter and Keith Merrow did a great job with the KM-7. It’s the details, that convinced me. You’ll get the large glow-in-the-dark side dots, beautiful bindings and an original Hipshot-bridge. The wood combination sounds very well balanced and the finish feels very comfy and durable. 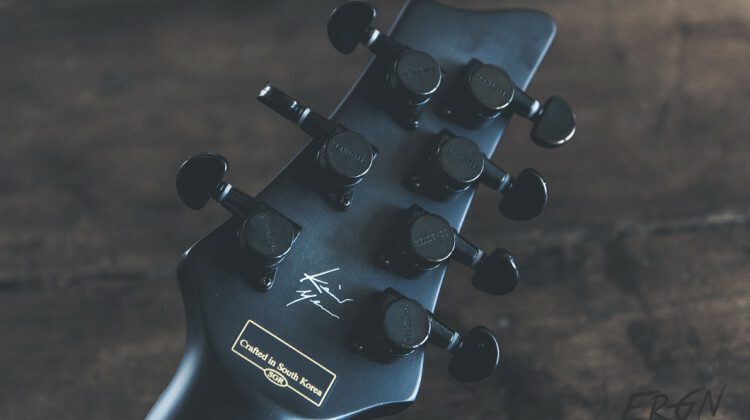 In the US, the KM-7 retails for $ 999 – a very reasonable price for such a guitar with these specs and features. 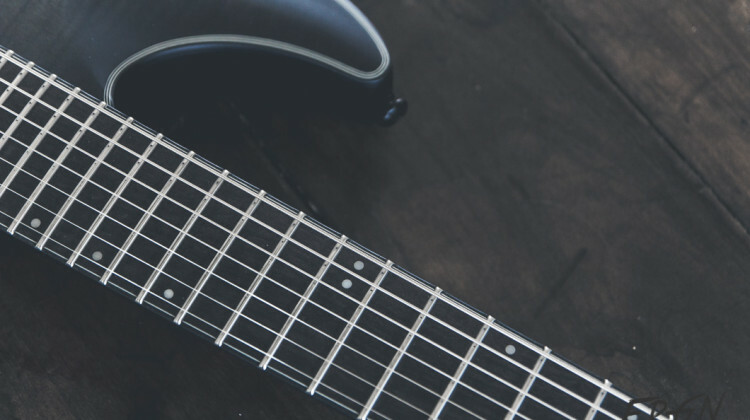 In the EU, the same guitar costs 1329€ – that’s an upcharge of about 44%. Although we’re used to higher retail-prices here I can’t understand the hefty price-difference, hence the lower price-rating. This is an unbiased, but sponsored review. 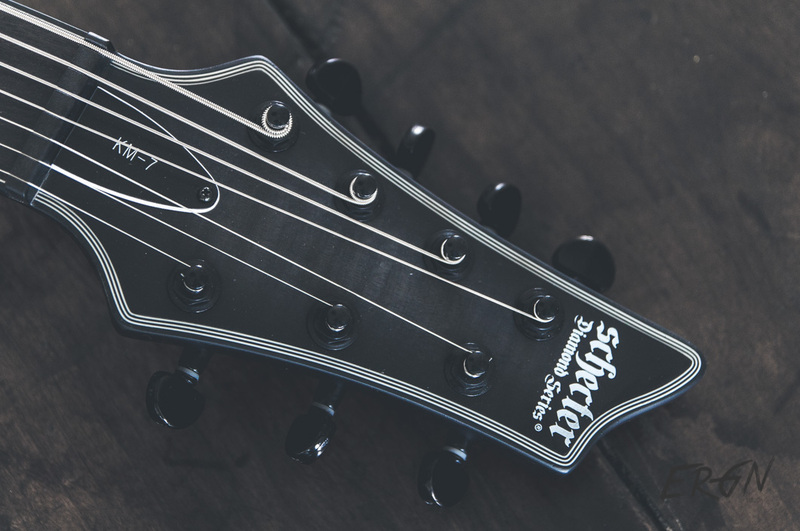 Our thanks go out to the german Schecter-distributor Musik Meyer for the test-guitar.